This mob spawns at 344, 330, -37 Spawns in the "Drosco" room. This page last modified 2017-06-05 18:55:04. The Nesting Rat is in location 7 on the EqAtlas map. I camped there for ages killing the three rats whenever they appeared. I kept seeing Giant Rats and Cubes spawning that conned Blue to my Lev 5 and I killed them all. I must have killed 50 rats before the Nesting Rat finally spawned and I was able to get the Golden Locket with Char +3 on it. Can someone please tell me the exact loc of this spawn? I think I may know where it is, but I am not sure since I have never seen either these rats or the Droscoe person of whom you all speak. There are three placeholders in the Drosco room for this mob...all large rats, and they're arranged in a semi circle of three facing the door...if Drosco is still alive, he's in the middle of them facing the door as well...basically, kill the large rats, and sometimes a nesting rat will spawn instead...in a bit more than an hour or so, I obtained around 8 of the necklaces...the necklace drops off of every nesting rat (as far as I can tell) as well. Im down in the aquaducts and cant find my way around have found a room with sharks and two guys that show up red though. And one room that had a pet. 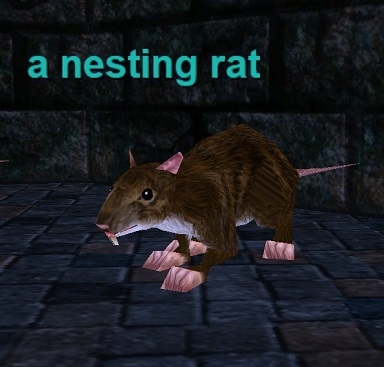 i wonder who in the world at Verant thought of a "nesting rat" as the creature you'd get a locket from? Sentiment without action is the death of the soul. On a good day in EC, you can sell one of these to lvl 10-13 chars for about 5-10pp. Thats how I usually made money for spells. Lord Karana! Punish those who defile the land of Norrath! Golden lockets sell to merchants for about 4gp and some silver.. I have sold most of mine for about 8gp to 1pp... all races and all classes can where it. How much is it worth? What classes and races can use it? I camped these for a while, they spawn like 1 in 3 spawns of the 3 rats there.